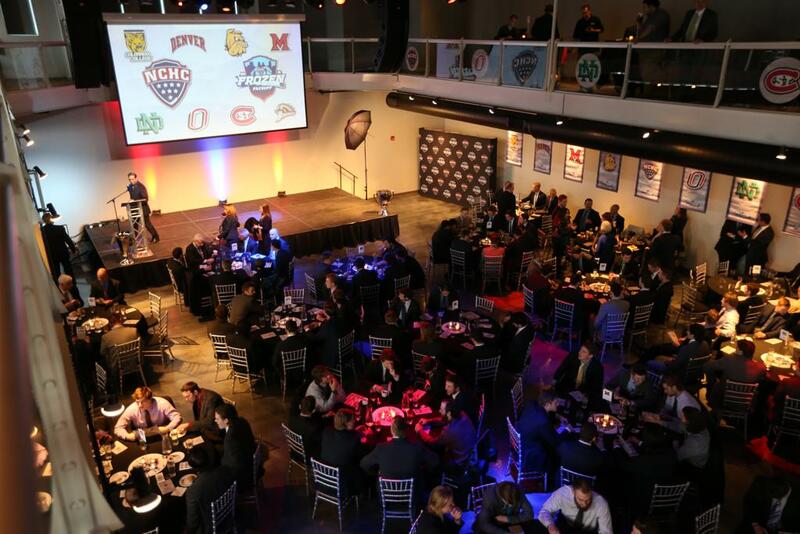 MINNEAPOLIS – With the National Collegiate Hockey Conference (NCHC) ready to crown a tournament champion this weekend at the NCHC Frozen Faceoff, the NCHC put a cap on its 2014-15 regular season by honoring its individual awards winners at the second annual NCHC Awards Celebration Thursday evening at Muse Event Center. 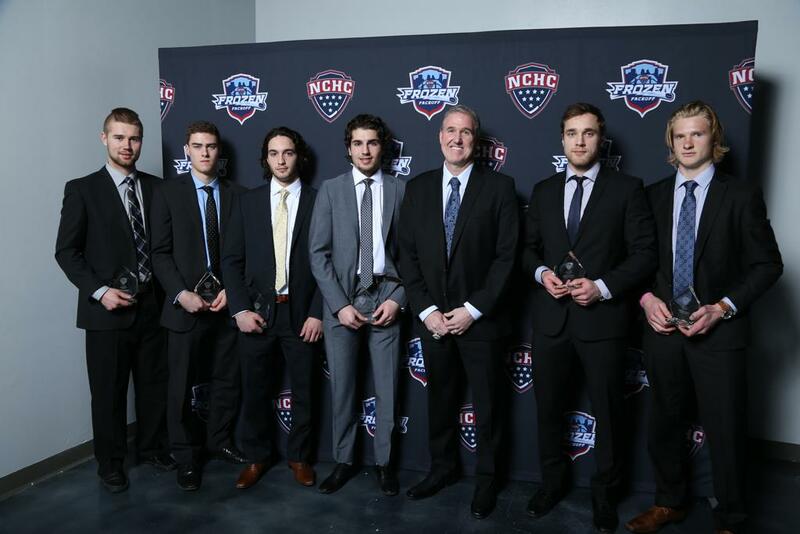 Denver and North Dakota combined to take home nine of the 10 awards with DU capturing five honors, including three by senior defenseman Joey LaLeggia, while UND won four awards, including head coach Dave Hakstol, who was named Herb Brooks Coach of the Year. LaLeggia (Burnaby, B.C.) became the first defenseman to take home NCHC Player of the Year honors, while he also repeated as NCHC Defenseman of the Year and NCHC Offensive Defenseman of the Year after winning the latter two awards in the NCHC’s inaugural season. The Hobey Baker Award finalist led all NCHC defensemen in conference play with 12 goals, 17 assists and 29 points while he finished second in the conference scoring race. The senior averaged 1.26 points per game which helped him earn his three major conference awards this season. He was the lone unanimous selection to the All-Conference First Team and won NCHC Player of the Month back-to-back in January and February. LaLeggia was also named Bauer NCHC Defenseman of the Week five times during the season. The Edmonton Oilers draft pick posted a plus-12 rating overall, which was sixth among NCHC blue liners, while his plus-9 rating in conference play ranked fourth. He blocked 24 shots in 23 NCHC games, as well. 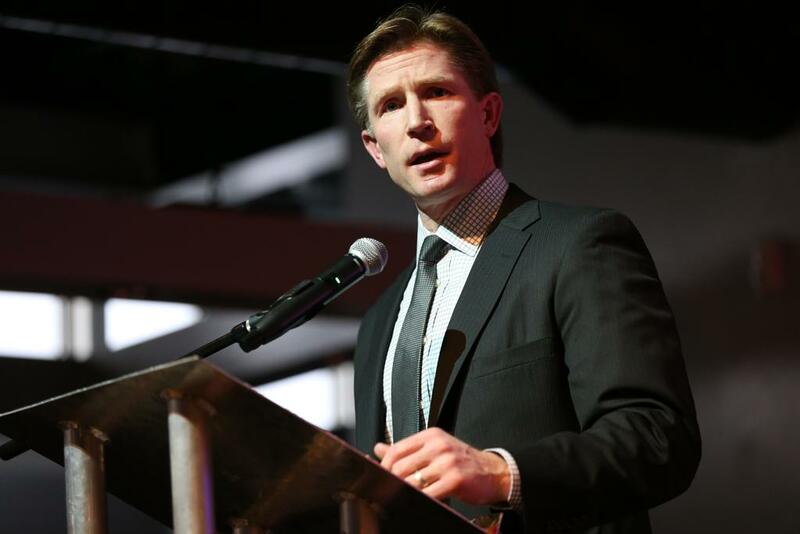 Hakstol won his first Herb Brooks Coach of the Year honor after leading North Dakota to a 16-6-2 record in conference play to win the NCHC regular-season title by six points and the school’s first Penrose Cup. This year marks his 11th consecutive 20-win season while he’s led UND to the NCAA Tournament each of those seasons as well. As is custom with Hakstol’s teams late in the year, UND lost just three games in the second half of the season. With a .708 winning percentage in conference play, he led UND to its best win percentage since the late 90s. In non-conference play, North Dakota finished 9-1-1 which helped the school earn a number one ranking nationally much of the season. Hakstol is also now a finalist for the Spencer Penrose Award as the National Coach of the Year. 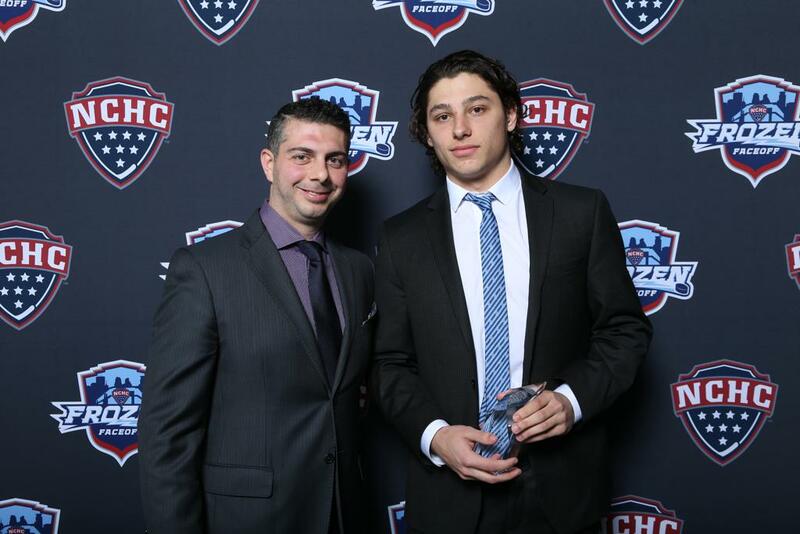 Joining LaLeggia among the Pioneer winners was freshman forward Danton Heinen (Langley, B.C. ), who finished conference play with 26 points in his rookie campaign, good for third in the NCHC and tops among freshmen. A unanimous pick for Rookie of the Year, his nine goals in 24 NCHC games were second among freshmen while he led rookies with 17 assists. Heinen finished with two game-winning goals and a plus-11 rating, both of which tied for first among NCHC freshmen. He was also a unanimous selection for the NCHC All-Rookie Team and earned Second-Team All-Conference honors. 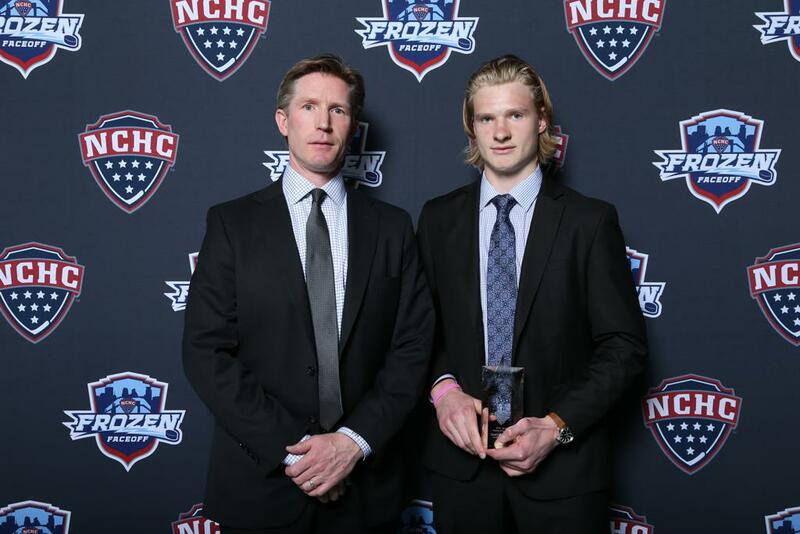 The Boston Bruins draft pick won Bauer NCHC Offensive Player of the Week once and took home the Rookie of the Week award four times on the season. He was also NCHC and National Rookie of the Month for February while his 42 points in all regular-season games led the NCHC. 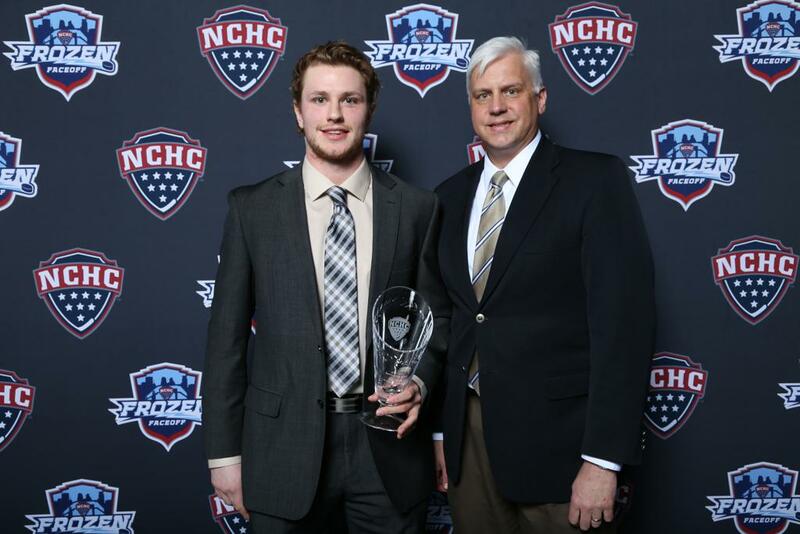 Rounding out DU’s award winners was sophomore Trevor Moore (Thousand Oaks, Calif.), who took home NCHC Forward of the Year honors as he won the conference scoring title with 30 points in 23 conference games, good for 1.3 points per game, also best in the NCHC. The undrafted standout finished tied for first in conference play with 13 goals and third in assists with 17. 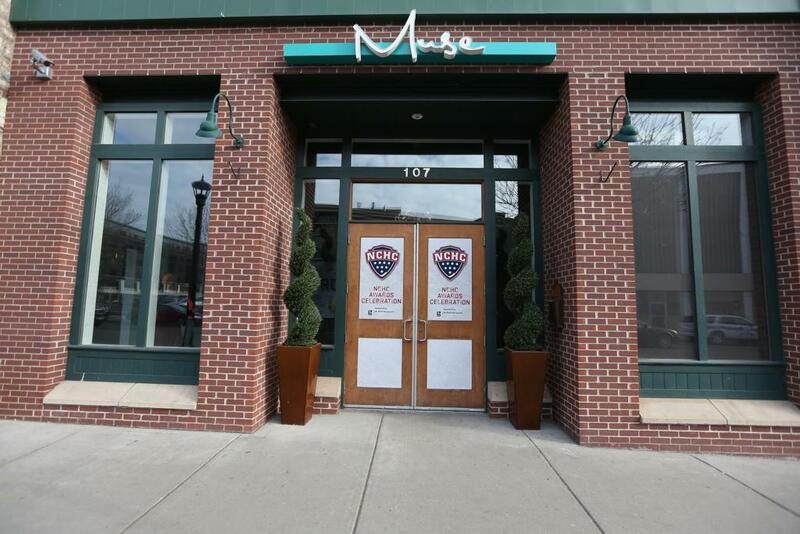 Moore posted a plus-15 rating, which was tops in the conference, while he tallied two game-winning goals. He finished the season strong with eight goals and 15 points in the final eight games of the regular season, earning him Bauer NCHC Offensive Player of the Week honors to close the season. He also garnered First-Team All-Conference honors and totaled 39 points in all games, including an NCHC-best 19 goals. 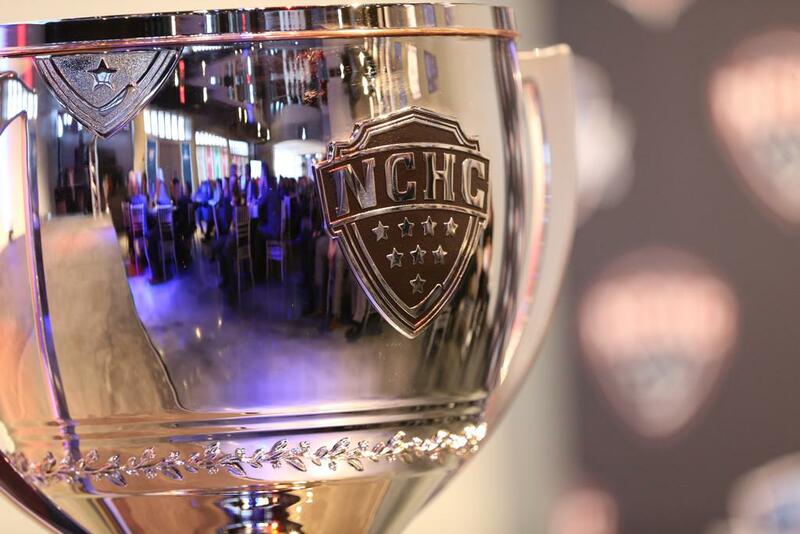 Joining Hakstol as an award winner from North Dakota, junior netminder Zane McIntyre (Thief River Falls, Minn.) was tabbed NCHC Goaltender of the Year after he backstopped North Dakota to its first Penrose Cup and a 16-6-2 conference record. The junior played in every game for UND this season, earning an NCAA-best 25 wins in the regular season, while he was one of just two NCHC netminders to start all 24 conference contests. A Boston Bruins draft pick, he won four more conference games than any other goalie in the league while his 704 saves also led the NCHC for the season. 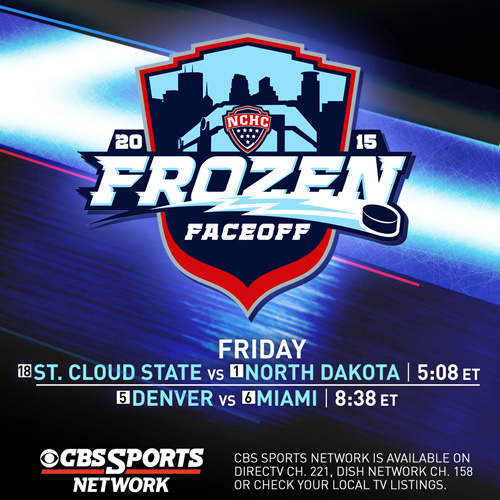 McIntyre posted a .931 save percentage in NCHC games, good for second. His 2.15 goals-against average ranked him third in the league. McIntyre earned Bauer NCHC Goaltender of the Week honors four times on the year and was also named to the NCHC All-Conference First Team. He is also a Hobey Baker Award finalist and a Mike Richter Award finalist, given to the top goalie in college hockey. 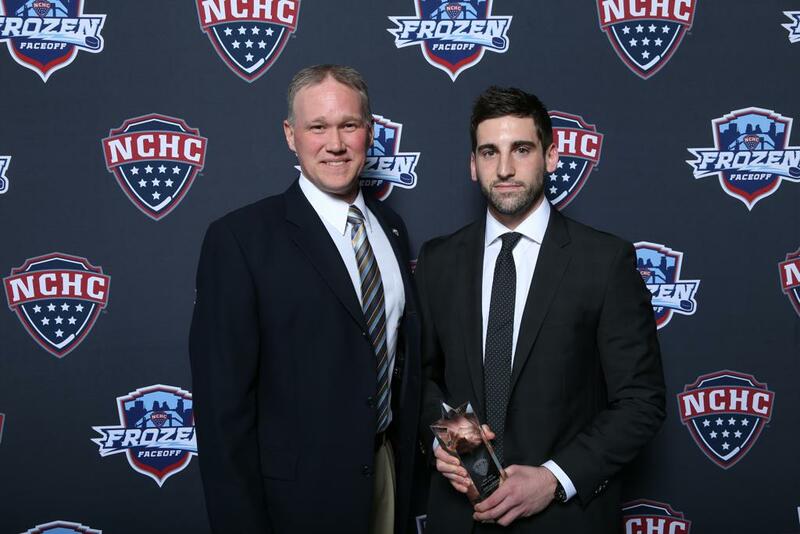 Capturing NCHC Defensive Forward of the Year was UND’s Mark MacMillan (Penticton, B.C.). The senior center blocked 17 shots in conference play and posted a plus-11 rating in NCHC action, which was third among forwards. He also finished a plus-9 on the season in 29 games overall before his senior season was cut short by injury after blocking a shot. A Montreal Canadians draft pick, he was one of just three players to score two short-handed goals in conference play this year, tallying both in the same game. That earned him Bauer NCHC Offensive Player of the Week honors and NCAA Second Star of the Week accolades. MacMillan also chipped in offensively with 20 points on a league-high 13 goals in just 22 conference games. The UND alternate captain was named to the NCHC All-Conference First Team and is a Senior Class Award and Hockey Humanitarian Award finalist. 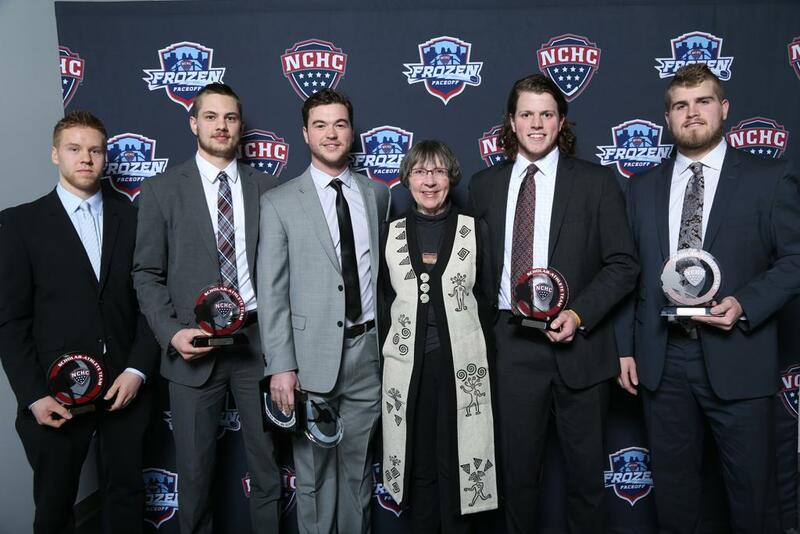 From among the NCHC’s Scholar-Athlete Team, UND senior defenseman Nick Mattson (Chanhassen, Minn.) claimed NCHC Scholar-Athlete of the Year to give UND four award winners on the night. Mattson is a management major with a GPA north of 3.9. The senior led North Dakota blue liners in scoring with 15 points on three goals and 12 assists in just 19 conference games, good for fourth in the NCHC among defensemen. He blocked 23 shots in NCHC action and finished with a plus-10 rating on the season, second among NCHC d-men. The Blackhawks draft pick earned Bauer NCHC Defenseman of the Week honors in late February and is a finalist for the Senior Class Award. 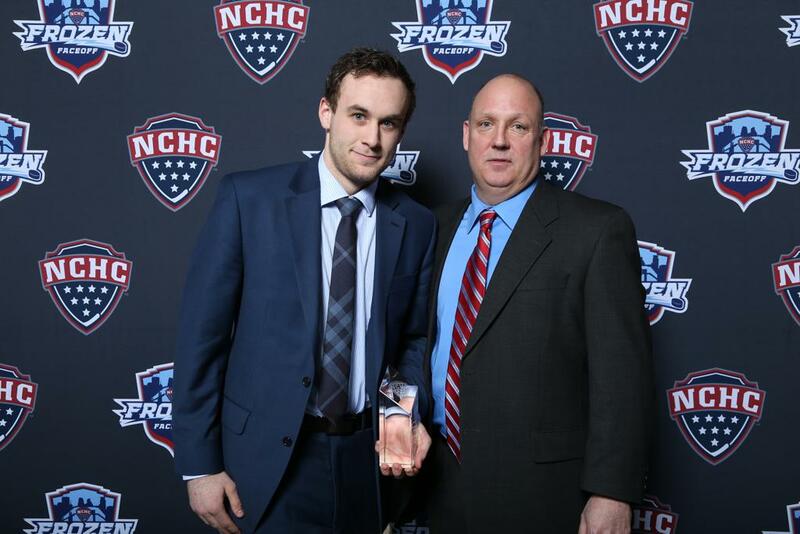 Mattson was named to the Academic All-America Third Team last year and received the NCAA Elite 89 award for having the highest GPA of any participant at the 2014 Frozen Four. 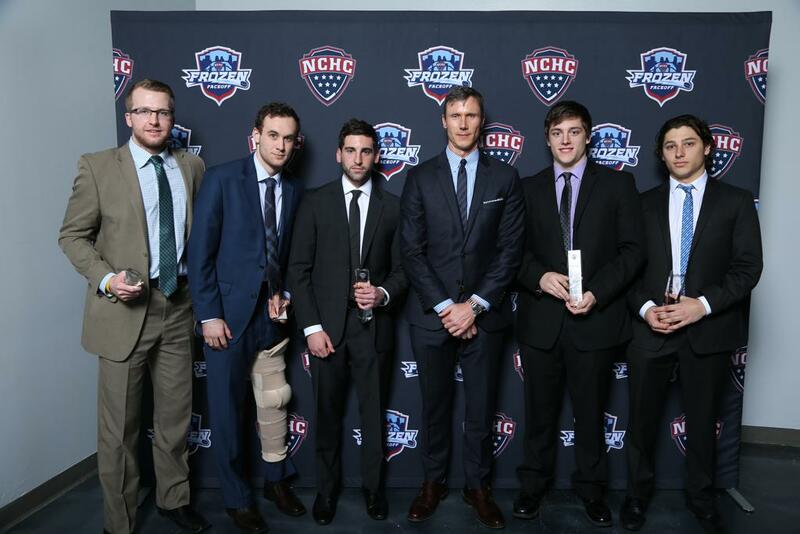 Rounding out the NCHC’s individual award winners Thursday night was St. Cloud State senior forward Nick Oliver (Rouseau, Minn.), who took home the NCHC Sportsmanship Award. A captain for the Huskies after being an alternate captain last season, Oliver is also an Academic All-Conference honoree for the third straight season for having a GPA above 3.0. Oliver has served on SCSU’s Student-Athlete Advisory Council and has volunteered at hockey camps back home. He scored two goals, including a game winner, and chipped in two assists for the Huskies this season, while committing just six minor penalties in conference play. As a forward, the Nashville Predators draft pick blocked 13 shots. He will graduate with a degree in Finance. 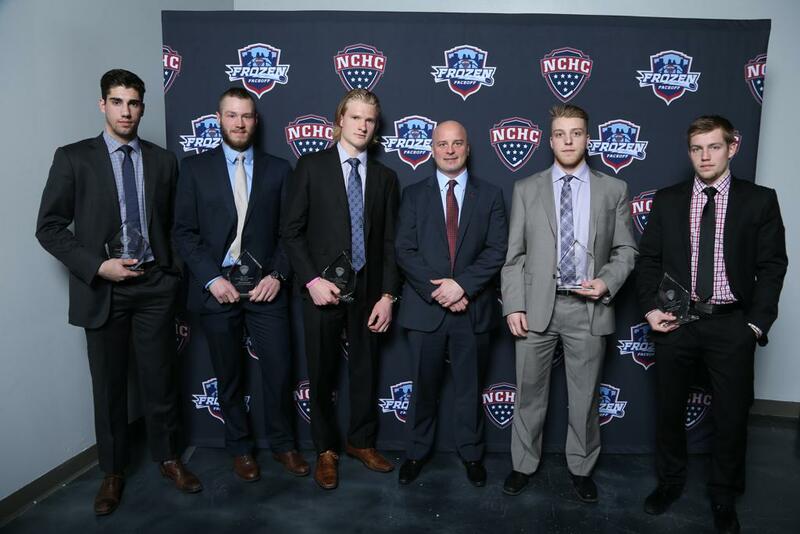 The NCHC Scholar-Athlete Team, All-Conference First Team, All-Conference Second Team and All-Rookie Team were all recognized as well at the Awards Celebration and received their awards after those teams were announced last week. 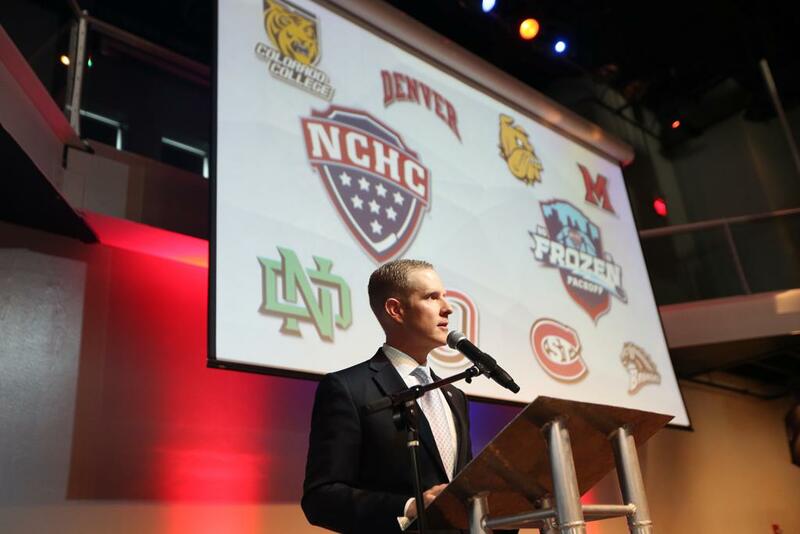 Most individual award winners were voted on by head coaches and select student-athletes, while the institutions Faculty Athletic Representatives (FARs) voted on Scholar-Athlete of the Year, coaches and athletic directors selected the Herb Brooks Coach of the Year and the NCHC Awards Committee chose the Sportsmanship Award winner. 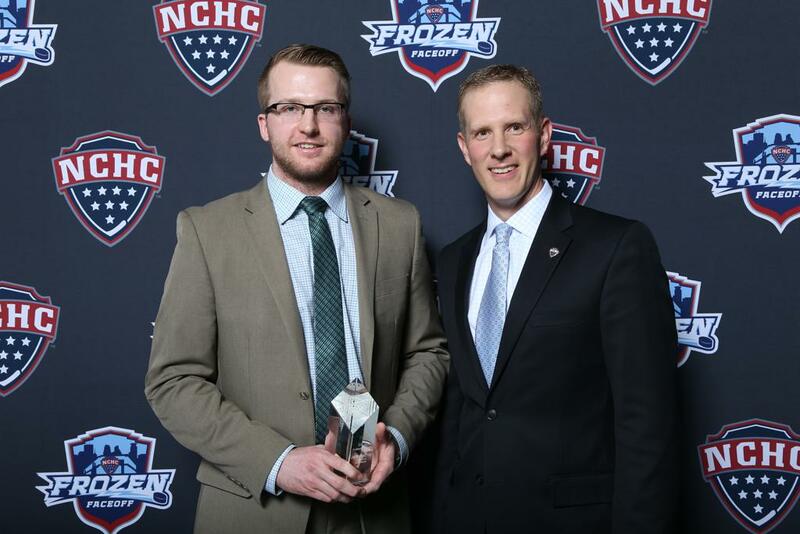 UND head coach Dave Hakstol accepts his Herb Brooks Coach of the Year Award from Herb Brooks' son, Dan Brooks.